Phoenix, AZ (November 8, 2018) — The law offices of Lerner and Rowe host their 1st annual Phoenix Thanksgiving Turkey Giveaway on Wednesday, November 21st. Families are invited to stop by their South Phoenix personal injury law office located at 52 E. Baseline Rd., Phoenix, AZ between 5:30 pm – 7:30 pm to pick up a frozen turkey. In addition, each frozen turkey handed out comes with a drawstring bag filled with side fixings! Albuquerque, NM (November 7, 2018) — Lerner and Rowe Gives Back hosts their first annual AlbuturkeyGiveaway on Monday, November 19th, in “The Pit” north parking lot at the University of New Mexico located at 1414 University Blvd. SE, Albuquerque, NM 87106 in partnership with Cumulus Media. Families are invited to stop by to pick up one frozen turkey between 5:30 pm – 7:30 pm. Plus, there will be live radio remotes and for each of the 1,000 frozen turkey handed out, a family receives a FREE drawstring bag! Join us at the Swing for the Kids event! Tucson, AZ. (November 1st)- Lerner and Rowe is sponsoring the Hole-in-one $10K contest for the Swing for the Kids event. This event benefits the Boys & Girls Clubs of Tucson and their after school activities. When: November 4th from 1 p.m. to 4 p.m.
Where: Top Golf Tucson, located at 4050 W. Costco Place, Tucson, Arizona, 85741. The mission of the Boys & Girls Clubs of Tucson includes providing young people with a distinct path to reach their full potential and pursue and fulfill their dreams. Boys & Girls Clubs of Tucson has pioneered youth development in Tucson for over 50 years and plans to continue for more. The Boys & Girls Clubs of Tucson currently provides after-school programming as well as affordable alternatives to over 9,000 youth across Tucson. They also serve over 4,500 active club members each year at their six Clubhouse locations throughout Tucson. The Boys and Girls Clubs’ programs run year-round. They are also some of the safest, most fun and even affordable for all youth. Interested in giving back to the community? You can explore other community events and the Lerner and Rowe Gives Back non-profit foundation here. Even if you can’t be at Swing for the Kids, there are always ways to give back to the community. To connect with the law firm socially, follow Lerner and Rowe on Twitter. Or, you can also become a fan of their Facebook page. Contact us today to find out more about how you can join the offices of Lerner and Rowe in their community support or if you were injured by the negligent acts of another. Lerner and Rowe proudly announce their sponsorship of SALEF’s Cops and Rodders Car Show. As southern Arizona’s largest one-day show, Lerner and Rowe hopes to see you at the Cops & Rodders Car Show. When: Saturday, November 3rd 8 a.m.-4 p.m.
Why: The car show serves as a fundraising event for the local police force, including Tucson, Marana, University of Arizona Police, and the Pima County Sheriff’s Department. Cost: FREE for spectators including parking. As an attendee, you can see 900 show vehicles, including law enforcement and military displays. Cops & Rodders showcases several other Arizona area police agencies including Tucson Police Officers, Marana Police Officers, Pima County Sheriff’s Deputies and University of Arizona Police, as well as several others. Mingle with the local police officers, deputies and many surrounding law enforcement agencies and view police department equipment and assets. Don’t miss the helicopter, SWAT mobilization vehicles, Bomb unit, K9 units, Motorcycle units and Bicycle Patrol units, Recruiting, and so much more! Looking to give back to the community? Explore our other events in the community and our non-profit foundation Lerner and Rowe Gives Back here. The Lerner and Rowe Gives Back organization strives to change the community and improve the lives of people in need by giving back. Discover more about our philanthropic endeavors by following our pages on Facebook and Twitter. We always can use more volunteers or attendees; so, contact us for more information on how to give back. We look forward to seeing you at the car show or at our other charity events throughout the year. Contact us today to find out more about how you can join Lerner and Rowe in their community support or if you were injured by a car accident. So, don’t wait! Lerner and Rowe sponsor the 6th Annual Gala and Auction put on by the Children First Foundation. Scottsdale, AZ- Lerner and Rowe would like to announce their sponsorship of the Children First Foundation 6th Annual Gala and Auction Event. This year’s theme is “It Takes OUR Village” which agrees with the idea it takes a village of partners and supporters to meet the needs of just one child. The Children First Leadership Academy encourages students to think critically, become problem solvers and, most importantly, active citizens. The Children First Leadership Academy and Lerner and Rowe believe that it takes a community effort to provide the support and understanding that children need so that they can succeed academically, socially and emotionally in spite homelessness and other detriments. The Children First Leadership Academy educates children with more than classrooms, desks, or textbooks. Want to give back to the community? You can explore other events in the community and the non-profit foundation Lerner and Rowe Gives Back here. Lerner and Rowe Gives Back strives to make a difference in the community and the lives of people in need by serving and giving back. Find out more about our philanthropic efforts by liking our page on Facebook and also following us on Twitter. Even if you can’t attend the gala, there are always ways to give back to the community so contact us for more information. Contact us today to find out more about how you can join the offices of Lerner and Rowe in their community support or if you were injured by medical malpractice. Don’t wait. We look forward to seeing you at our other charity events. Tucson, AZ (September 2018) Lerner and Rowe proudly announce their partnership with the Southern Arizona Law Enforcement Foundation for the 4th Annual Charity Golf Tournament. Lerner and Rowe invite you to join them for a day on the links to support your local Tucson police officers. Lerner and Rowe Injury Attorneys are the title sponsor for this event that takes place Saturday, September 22, 2018, at the La Paloma Country Club. Lerner and Rowe Injury attorneys were the title sponsors last year for this incredible event and look forward to another incredible year. The tournament will benefit the ongoing efforts of the Southern Arizona Law Enforcement Foundation (SALEF) to keep the Tucson area police officers safe. The SALEF raises funds for critical life saving equipment, technology and training. The tournament will take place on the gorgeous La Paloma Country Club. Your registration comes with golf, golf cart, warm-up at driving range, terrific goodie bag, CORE Construction Golf Towel and a deli lunch sponsored by CORE Construction and D & H AC. Your registration also comes with an opportunity to win $5,000 cash Hole in One courtesy of Premier Pacific Bank. And Thank a Cop Day. Lerner and Rowe Injury Attorneys has years of experience handling a variety of cases and we will put them to your case. For additional information about Lerner and Rowe’s Tucson personal injury attorneys call 520-977-1900. August is coming, and parents know what this means, back to school time! Lerner and Rowe Gives Back recognizes the importance of education and supports it every chance they get. This year, Lerner and Rowe will provide school district- approved backpacks filled with supplies to elementary school aged children*. 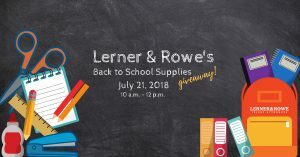 Join Lerner and Rowe Gives Back for their Phoenix Back-to-school giveaway on July 21st, from 10 AM to 12 PM at our South Phoenix location (52 E. Baseline Phoenix, AZ 85042) to receive some fantastic giveaways (while supplies last). For an exciting morning, you and your loved ones can enjoy Mr. Softie, partake in our popcorn or cotton candy machines and even get your favorite balloon animal made by our jolly clown. Children must be present and accompanied by an adult. *Limited supplies available as the backpacks will be given out on a first-come first-serve basis! Make sure you join us on the 21st! We look forward to seeing you there. Please reach out to Cindy Ernst with any questions by calling 602-977-1900 or via email at [email protected]. Lerner and Rowe Gives Back are proud to support the members of Valley of the Sun United Way’s Women United. In Maricopa County, many school children have to face each day without the guarantee of a nourishing, wholesome breakfast in the morning. We all know that breakfast is the most important meal of the day. It’s the fuel your body uses to power your body and mind. This is why it is of the utmost important that children are properly fed before beginning their school day. Valley of the Sun United Way seeks to end this concern for low-income families by providing nutritious breakfast to 130 schools in our county. Lerner and Rowe Gives Back are proud to support their efforts by being a $5k Supporting Sponsor of the We Are UNITED- Women United Luncheon. This signature event seeks to raise funds to put towards hunger-ending efforts, such as Breakfast in the Classroom and WeekEnd Hunger Backpacks, in Maricopa County. The Luncheon takes place on Friday, May 18th, at Arizona Biltmore Resort and Spa in Phoenix, Arizona. The Luncheon will take place from 11:30am to 1:30pm, with a VIP reception preceding the event at 10:30am. Lerner and Rowe Gives Back would like to encourage you to donate your time and effort, along with financial donations if you can, in order to create positive changes in our local community. As a special treat this year, the event’s keynote speaker is none other than multi-faced artist and entertainer Vanessa Williams. She is known worldwide for her musical talents and television and movie appearances, with a career that has spanned decades. She is one of the most respected figures in the entertainment industry. In 2007, Vanessa Williams was honored with her own star on the Hollywood Walk of Fame. Women United is more than excited to have her present as the keynote speaker for the VIP Reception. The nation’s first United Way was founded 125 years ago by Frances Wisebart Jacobs. Her philanthropic spirit has encourages women to pursue change in their communities and the world, and is the powering ideal behind Women United. This community has a clear mission: “inspiring and connecting philanthropic Women to equip our community for success.” The members of Valley of the Sun United Way’s Women United create significant change in our community through their volunteer efforts, support, and donations. They then take it one step further by encouraging and inspiring others to produce positive community changes in their own ways.